In the previous article, we looked at Datums–basic definitions, how they’re shown on drawings, and so on. We learned that a Datum is an abstract geometric concept and that a Datum Feature is an actual feature on a part that corresponds. Now it’s time to talk about Datum Feature Simulators. When I first came across the term, my reaction was, “What an odd term–Datum Feature Simulators?” In fact, the term that was used before Datum Feature Simulator was added to the standard in 2009 was, “True Geometric Counterpart,” which is only slightly less odd. Let’s make this easy–a Datum Feature Simulator is a real physical feature of the machinery that comes in contact with the part. We might be talking about a feature on the CNC machine, such as the table on a VMC or spindle axis on a CNC Lathe. We might be talking about some metrology or measuring equipment–for example a granite surface plate or a Go-NoGo Gage. These physical devices can all have Datum Feature Simulators that are relevant to our discussions and knowledge of GD&T. Another way to think of a Datum Feature Simulator is that they are inverses of Datum Features. Okay, one more way to think of a Datum Feature Simulator–think about how you would inspect a dimension or tolerance called out by GD&T. Whatever setup you will use is going to include appropriate Datum Feature Simulators. 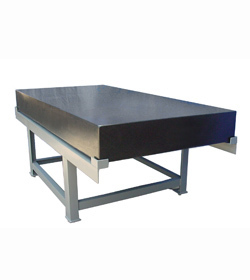 Plane Machine Table, Surface Plate, Angle Plate, etc. It’s easiest to think in terms of Datum Features on your parts when deciding which Datums to select. Datum Features (and their corresponding Datums) are selected on the basis of design requirements and functional relationships. You will usually wind up choosing those Datum featues that determine orientation, location, and functional relationships of part features and their mating parts. Often, the first thing to do is determine which Datum Features will be used to locate and orient the part. For example, consider a bearing. It will typically be located by one surface of the bearing going flat against a surface in a bearing pocket. That surface clearly should be a Datum Feature and will thereby result in a Datum. The second Datum Feature needed to orient the bearing is its axis. Given those two, we can pretty much describe exactly how that bearing is to be fitted into mating parts and that’s all that’s required. Once we locate and orient the part, there may still be key features that must also be located and oriented but that are not completely specified by the Datums choosen to orient and locate the part. If there are any of these, add more Datum Features to locate and orient these features. As you’re applying GD&T to your drawing, you may discover you’ve omitted a Datum for some control you need to establish. No worries, the system has double checked itself and you can add an appropriate Datum for that control.